The government’s recent announcement of relax on cooling measures is like a shot in the arm to the market sentiment. While many people do not feel the impact immediately, but there’re long term implication that could bring repercussion effect to the market in the coming years. The seller’s tamp duty and holding period would be lowered for residential properties bought on and after Mar 11. The new SSD rate for the 1st three years will be 12%, 8%, and 4% respectively. There may seem to be no compelling reason for the government to re-calibrate any relax on cooling measures at this junction, given that the market is showing signs of bottoming out in the absence of active intervention. Going by the URA price index, , prices now stand at 2010 level. This puts the price increase over the past decade, between 4Q 2006 and 4Q 2016, at 3.6% annually on a compounded basis, which is in-line with inflation rate with a slight premium to account for the illiquidity of the real estate. One possible reason the government is shorten the SSD could be in preparation for the shortage of supply by 2019 & 2020 for newly completed condos. 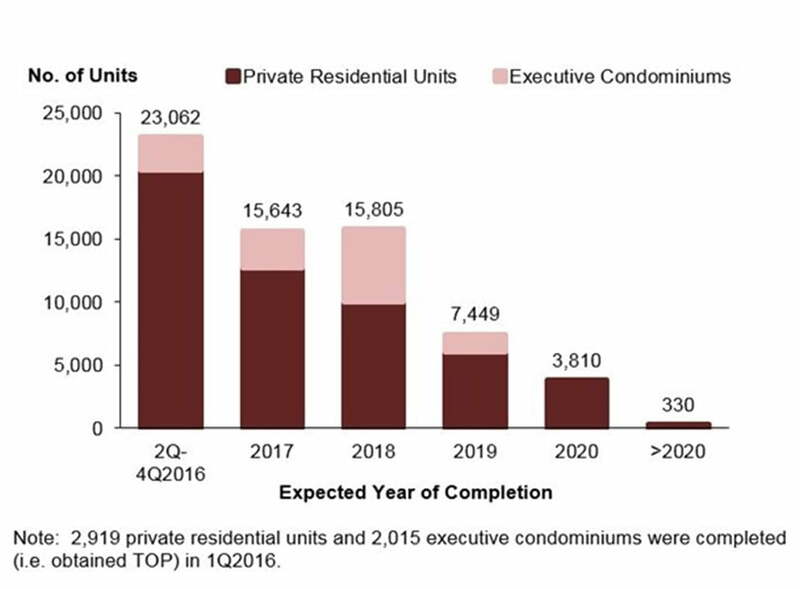 (see below chart) In the next 2-3 years, there would be sharp decline of completed condos (including ECs) by year 2019 & 2010, way below annual average of 15,000 in the past 10 years. With shortening of SSD, there will be more units available by Mar 2020, as buyers who bought the unit today will be free to sell by then. Any buyers who prefer to have better flexibility to sell when market is good. Instead of waiting 4 years, now they only need to wait for 3 years. Especially to those new launch investors, they may be able to flip and make a profit even before project TOP. As for mid to big size development, construction could take up to four years. With merely 20-30% (including ABSD) down payment and marginal monthly installment ( a few hundred dollars maybe), potential investment return could achieve close to 100% within 3 years if property price were to went up 20%. If you are interested to find out more information on How real estate investment help you to grow your money, read this post – How to grow $300K into $2M through real estate investment. TDSR (Total debt servicing ratio) will no longer apply to mortgage equity withdrawal loans with a loan-to-value ratio (LTV) of 50% and below. This follows from the feedback that the TDSR framework has limited homeowners’ flexibility to borrow against the value of their properties in their retirement years. Property owners who bought the properties in 2006-2011 and made profits. For example, Mr Tan who bought a condo in year 2006 at price of $600k. The market value of his property is now $1M, with outstanding loan of $100K. Under the new framework, he can cash out $400k by taking an equity loan (50% of LTV – outstanding loan $100k) which does not subject to TDSR. These loans are an easy way to free up extra cash at a low prevailing mortgage interest rate so he can strengthen his investment portfolio, start a business, or handle a financial emergency. Feel free to contact me if you would like to have a discussion on how to interpret the policy change and understand what does that mean to you as an investor.